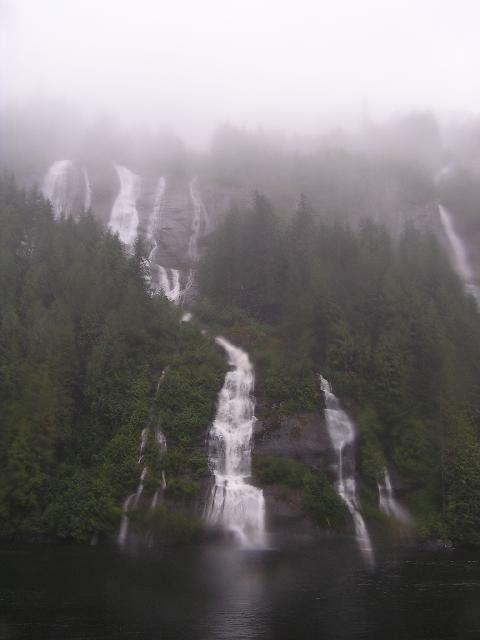 Notes: I went to Bailey Falls in Alaska September 3, 2007 when I took a tour into the Misty Fjords National Monument from Ketchikan, Alaska on the Majestic Fjords cruise boat through Alaska Cruises, Inc. There were hundreds of unnamed waterfalls flowing down the 3000 foot cliffs from both rainfall and melting snow above. I was told this waterfall was named Bailey Falls, the only waterfall known to the tour guide. With this trip and these waterfall photos of waterfalls in Alaska, I completed my goal to find and photograph at least one waterfall in each of the 50 states. Page last updated 07 Sep 2007.